Hong Kong Organic Waste Recycling Center (HKOWRC) is the first organic waste management consulting firm in Hong Kong. We dedicated to help provide customers one-stop organic recycling services. Our mission is to provide practical solutions to reduce food waste and to assist in the collection of food waste and other organic waste to make your company more environmental friendly. We possess complete and professional environmental consultants to provide consulting services to private enterprises and institutional sector clients. Hong Kong generates about 4,200 tons of organic waste daily, including more than 3,000 tons of industrial, commercial and domestic food waste. In addition, there are various types of organic waste, animal carcasses, etc. 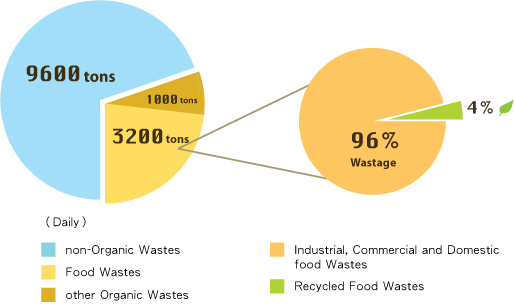 Only about 4% of organic waste is being recycled. - Health issue is involved in recycling of organic waste so the collection process is more difficult than the other waste. - The value of the recycled products is generally low and recycling market is immature. -The public do not have enough knowledge of recycling of organic waste and recycling pathways. Hong Kong Organic Waste Recycling Center was established in 2011. In combination of local experts and foreign technology and experience to handle organic waste, we ought to provide the best solution to solve the above problems. HKOWRC adopts latest international biotechnology and equipments to provide different types of organic waste producers a one-stop recycling and material regeneration services. In addition to thorough civic education and promotion project in urban area, we can turn the page, and take the new departure of recycling.